Those of you that are OG Twitter followers of mine know that I live my life in a daily war against #SmallSampleSize takes, so I’m taking that into account but also try to make some meaningful statements about the baseball team. Now I sit back and hope I don’t get featured on Freezing Cold Takes in April. As we discussed on the season preview episode of Dogpile, Mississippi State effectively had two catchers ranging between average to slightly below average defenders last year, so they rode whichever one had the hot bat. This year, they have much more at their disposal. It’s just a six-game sample, but Dustin Skelton seems to have made some serious strides as a defender. (Which will surprise no one who read my feature on the catching coach, Kyle Cheesebrough.) Plus Skelton has more home runs in the first two weeks of 2019 than he had in 2017 and 2018 combined. MSU has wasted no time turning to the freshman Hayden Jones, who displayed a weapon of mass destruction attached to his throwing arm this weekend. He can improve in other aspects of defense, but he did not bow to the challenge of Southern Miss pitching, getting a hit in each of the games he played in, one of them a double. We’ve gone this far and still haven’t mentioned Marshall Gilbert, who is returning after weeks of quality play last year and went 2-4 in starting at DH this weekend. The days of forcing Josh Lovelady to catch literally every single game, taking his intangible benefits alongside his low batting average, are over. Catcher has the makings of a plus position for the Bulldogs. Replacing Hunter Stovall’s glove was going to be borderline impossible, thus I expected MSU to take defensive regression at that position. The hope was his replacement would bring enough of a bat to still make it a plus position. I really expected that to be Gunner Halter, a guy who came from junior college with an awesome bat and work to do on the defensive end. It seems the coaching staff had a similar level of confidence in him, but then he got subbed out of the second game of the Southern Miss series for Landon Jordan, who started the final game. I’m not giving up on Halter yet, even after he went 0-for-7 against Southern Miss. The point of this is the expectation was for Halter to be the every day second baseman all year, and now that’s not as solid. Again, I’m not saying second base won’t be a plus position. I’m saying we don’t know who will be getting the innings to try to make it a plus position. No one thinking rationally would’ve expected this start from Rowdey Jordan (.154 batting average, striking out in 26.9 percent of his at-bats compared to 20.7 percent last year). Yet, the Bulldogs still got 10 hits from the 1-4 spots in the lineup on Saturday and Sunday, after moving Jordan down, and of course won both games. Jake Mangum is the constant, and the cast of Jordan Westburg (1.035 OPS), Tanner Allen (17 RBI in seven games) and Elijah MacNamee (three of his seven hits going for extra bases) gives MSU options. Assuming Rowdey Jordan will start hitting like Rowdey Jordan again soon, that’s four guys for the three spots behind Mangum. It’s unlikely more than one of those guys will be slumping at a given time, but even if it happens, you could still turn to the quality contact from Justin Foscue in a pinch. MSU should always have something it can depend on from the top of the order. Jared Liebelt and Trysten Barlow both had ERAs north of 13 last year, combining to allow a batting average of .348. One year later, Liebelt pitched 2.2 scoreless, hitless innings in a crucial series win over Southern Miss; Barlow got four high-leverage outs in the Sunday win that clinched the series. They are a microcosm of a bullpen depth that MSU has not had in my time here, this being my third baseball season. Think about this: the Bulldogs won a series with a national spotlight on it and never used Peyton Plumlee, the guy that was nearly its Sunday starter. Because they have so many options. For some reason I’ve never been able to shake the moment at the SEC Tournament in 2017 when then-coach Andy Cannizaro said there were exactly six pitchers on the roster he trusted with the ball. 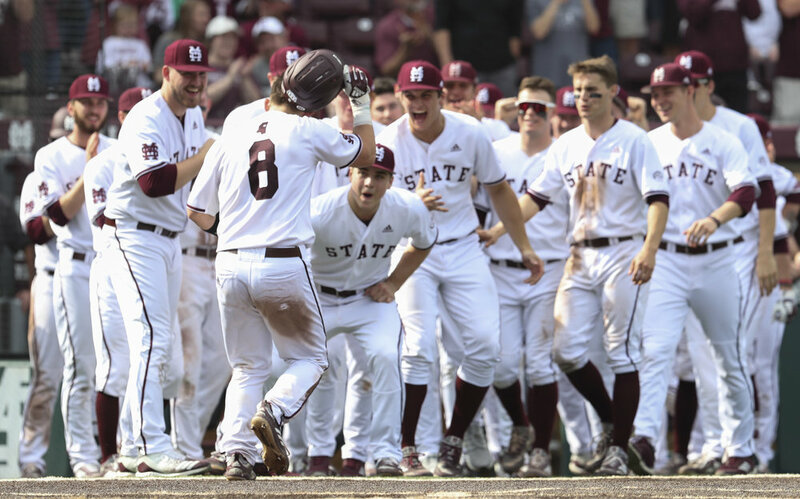 With the early returns on some returnees and the promising crop of newcomers, I don’t anticipate MSU having the thin bullpen it’s survived with the last two seasons. Barlow and Liebelt performing the way they did against a solid Southern Miss lineup gives reason for hope, but it’s far from doing it four weeks in a row in league play. The same goes for all of these freshmen. Yes, Colby White throws gas. I think we all agree Jack Eagan and Brandon Smith have looked excellent in their debuts, and Cole Gordon looks like he picked up right where he left off. But the SEC schedule gives MSU a true proving ground to begin: a road trip to Florida before home series with Auburn and LSU. I’m going to wait until then to make any declarative statements about the bullpen.